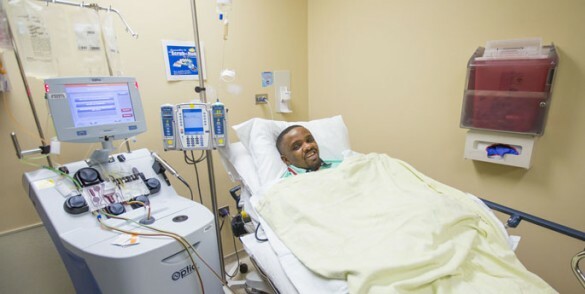 Two survivors of a 2014 Ebola outbreak in Nigeria visited Vanderbilt University Medical Center last week to share their experiences and participate in a study aimed at finding ways to treat the often-fatal infection. The survivors are physicians at the First Consultants Medical Center in Lagos, where a Liberian man infected with the Ebola virus was admitted in July 2014. Eleven doctors and other hospital staff who came in contact with the man became infected, and four of them later died. Because hospital staff refused the man’s request to leave, and because those who were infected by him were kept in isolation, the virus was contained and did not escape into one of the largest and most crowded cities in the world. They “are my heroes,” said graduate student Valentine Chukwuma, a Nigerian native who contacted and visited three of the survivors. 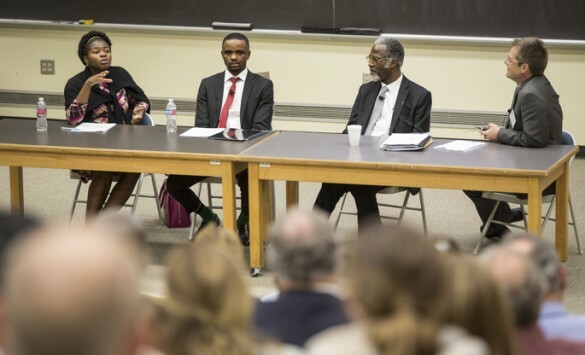 Two of them, Ada Igonoh, MBBS, and Morris Ibeawuchi, MBBS, came to Vanderbilt last week with Benjamin Ohiaeri, M.D., the hospital’s founder and chief medical director, to share their experiences. Igonoh described in graphic detail how she became ill days after the patient she’d treated died, and how she lay, at times helpless due to constant vomiting and diarrhea, in an isolation ward while colleagues who’d also been infected succumbed around her. Knowing that most deaths from Ebola result from dehydration, she forced herself to drink fluids. Five days later she began to feel better. She was released after her blood was found to be free of virus. Igonoh and Ibeawuchi gave samples of their blood and plasma so that Crowe and his colleagues could try to isolate highly potent, neutralizing antibodies that eliminated the Ebola virus. Crowe’s lab is pioneering methods for isolating and generating large quantities of antibodies produced by white blood cells against a number of potentially deadly viruses. The goal is to produce antibody “drugs” that can be injected to protect people at high risk of being infected, such as health care workers or exposed family members. Unlike vaccines, which stimulate the body to produce its own infection-fighting antibodies, the injected antibodies attack invading viruses directly. “There are a very limited number of Ebola survivors in the United States. We needed more donors to help us with this work,” said Crowe, Ann Scott Carell Professor and professor of Pediatrics and of Pathology, Microbiology and Immunology. “We’re optimistic we’ll find really important antibodies with the samples from Drs. Ibeawuchi and Igonoh,” he said. Crowe’s research on Ebola virus antibodies is supported by the Defense Threat Reduction Agency (DTRA) and Defense Advanced Research Projects Agency (DARPA) of the Department of Defense, and the National Institutes of Health.